Menthon Saint Bernard Castle is an amazing medieval complex located near the French town of Annecy. This location is famous for its textile industry, while being pleasant and a resort it is located in the north east of France. The city is led by the historic castle, Menthon Saint Bernard Castle as it is the main administrative center of Upper Savoy department (Haute-Savoie département) in the Rhone Alpes region. 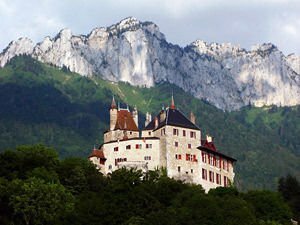 The medieval castle opens a wonderful view of the lake Lac d'Ansi Tiu and the small river at the foot of the French Alps, whose northern coast lies in the city Annecy. Menthon Saint Bernard Castle is located about 12 miles south of the city. From the castle, Lyon is located 102 km in a northeast direction and is also 32 km south of the Swiss city of Geneva. Menthon Saint Bernard Castle dominates the surrounding area by the height of the 200-foot cliff on which it is built. Just below the fortress remains the beautiful lake of Annecy. In 1989 the Castle Menthon Saint Bernard was declared officially a historic landmark by the French Ministry of Culture. The original fort on the scale of today's castle was raised about 923 years ago. Built entirely of wood, the castle was the observatory of the old Roman road that passed along the Lake of Annecy. Today the castle which stands has been constructed over the centuries, starting from the 13th and finished in 19th century. Menthon Saint Bernard Castle was named after the longtime owners of the family nunnery, which was housed in the mansion during the 12th century and since then until today they are permanent residents of the medieval palace. During the Renaissance period the castle was retooled in the spirit of the age, its then that the emblematic objects occur of pointed towers and even richer furniture. Today, visitors of the castle have the opportunity to enjoy some of the 105 rooms in the palace. Especially attractive for its authentic furniture is the Countess's bedroom. The kitchen is in its original form from the 13th century. Incredibly beautiful and lavishly decorated is the Great Hall where visitors may consider the paintings and antique furniture dating from the period between 16th and 19th century interesting.